Last week, we happily set out to the other side of the city to enjoy the Taj hospitality – a sumptuous couple lunch at The Hub, the coffee-shop. From the moment we arrived, we were very well-taken care of by the charming Restaurant Manager of The Hub, Mr. Christopher Varghese, as well as all the friendly & efficient staff. 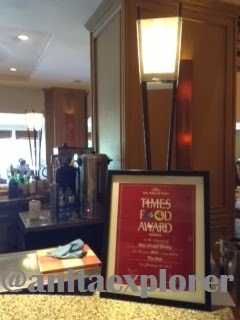 The Hub was voted as the 'Best All Day Dining Restaurant of Kolkata' by Times Food Guide. 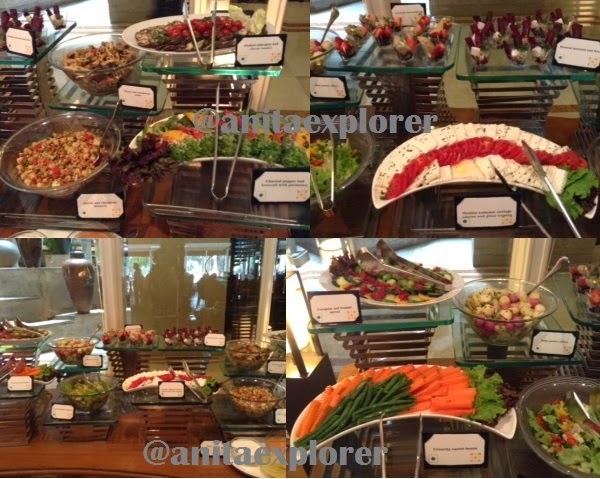 The Lunch Buffet starts at 12:30 PM. When we arrived, there were a few guests already who were helping themselves to the treats in store. The foodie in me was very glad & could hardly wait to indulge! Those dishes looked so appealing and there was such an amazing variety so artistically laid out that the photographer in me took over! They say- “A picture speaks more than a thousand words.” Then, many pics tell many stories! 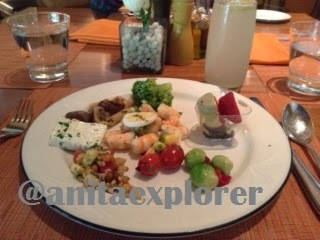 There was a mind-boggling variety of Salads- Spoilt for choice for Veg and Non-Veg. We had world cuisine on our platter! 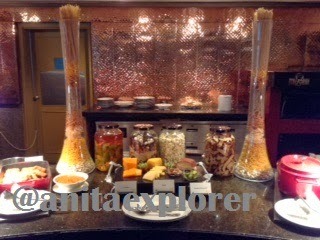 Many Continental and Indian specialties with several more international favourites were available. There were Mexican dishes- one spicy saucy gravy fish item & another was red kidney-beans (Rajma) in thick sauce. 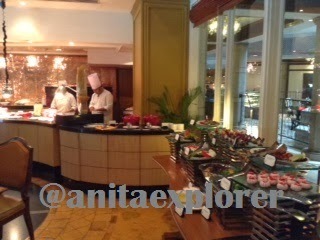 Taj Bengal had hosted a Mexican Food Festival some days ago and the Chef had learnt the preparation of the dishes. 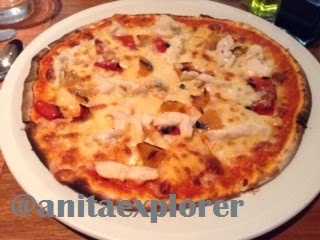 There was Italian Pizza and hot breads along with Indian breads like Naan of different types. Pizzas, pastas, panninis and focaccia are the signature dishes. We tried the fresh-from-oven Garlic Naan & Butter Naan and the thin-crust Cheese Chicken Italian Pizza. South-East Asian Style dishes were also there. Andhra-style Indian dishes were there too- Curd rice, Mint Chutney, Potato dish, Andhra Chicken Curry etc. Eastern India style Mustard fish was too yummy! 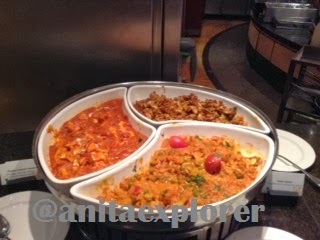 North-Indian style dishes were available too! There were some drinks like ButterMilk and juices like Mixed Fruit Juice. As if this wasn’t enough, we were even offered a complimentary soft-drink! I settled for sweet Fresh-Lime Soda. By this time, I had eaten enough of the main course (the effect of just sampling most of the dishes!) that there was no room in my tummy for desserts! There were so many wondrous sweets and treats! 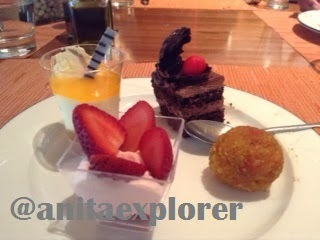 But, being a dessert-lover, I nevertheless ventured to dig into sweetness! I need to visit again to try out all the desserts! We got to meet the Chef too! Chef Ranjan personally asked us for feedback. 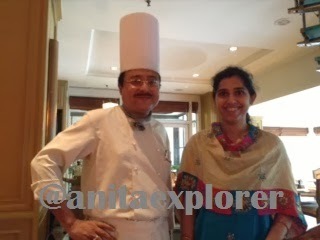 Coming up in my next Post: My Prized Moments At Taj Bengal – II. All these prized moments are courtesy- The Taj Bengal. The foodie in me was super-delighted to win the grand prize in Taj Bengal’s Valentine’s Day Twitter Contest - #ValentineAtTaj. Earlier I had visited to pick my special prize for being the Day1 Winner of the same contest. The heart-shaped chocolate cake from the Taj Bengal’s cake shop- La Patisserie was simply superb! At the end of the 5 days of the #ValentineAtTaj contest, I was declared as the grand prize winner! The Director of Sales, Mr.Arnab Chatterjee was constantly in touch with me regarding my Prize-Voucher! Thank you so much Taj Bengal for the great treats! If you want to avail yourself of a lunch/dinner experience at the Hub, do head to the Taj Bengal. Price- INR 1550+18.59% taxes per person. Kolkata has wow Restaurants- a specialty of Incredible India! Wow, so tempting. I was having a desire of eating there, but I was not that rich who can afford a treat there. You have taken some nice pictures. I clicked a lot more pics than I have shared here. Glad you liked them! I am sorry but I did not read anything. I was drooling at the pictures. Congratulations on winning their prize meal! Happens with me too when I see great food! 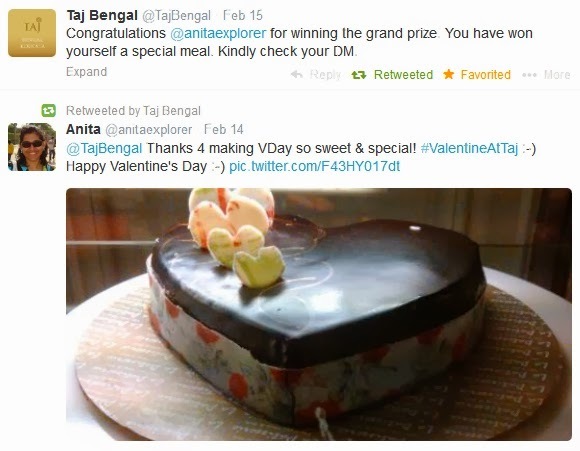 Anita congrats for winning Valentine Taj Contest.Anita the different food spreads are so sumptuous , mouth watering and inviting that I feel like taking a flight to Kolkatta to have lunch at Taj Bengal. WOW yum-yum ...the pics look SO yummy, I was not able to concentrate on the text!!! Congrats for winning.The spread looks rich. Yes, a rich lavish spread! :) Next time I'll let the pics do the talking! :) Words not needed! The pics look so tempting and delicious. Wow all dishes are looking so nice. thanks for share your success with us. Congrats!! Many congratulations on winning it Anita and lovely pictures! Thanks a lot :) Delighted you like the Foodilicious pics! Congrats Anita! You have described it in such a nice way that I can actually feel the taste! Anita, Very nicely detailed post with all the delectable pictures. All the spreads look lip-smacking. Hope you had a nice time. More so that you won it for yourselves. Congratulations on that. Thanks a lot :) Lip-smacking they were! Super post! Congrats for Ur super win! Wanna eat each dish U have photographed!! :D yummmyyyyy!